The human body contains two types of fat: subcutaneous and visceral. Subcutaneous fat is located near the surface of the skin, but visceral fat is in the abdominal area where it surrounds the internal organs. While excess fat has a negative effect on your health, visceral fat is especially dangerous. This type of fat that accumulates around the mid-section puts you at greater risk for chronic diseases. 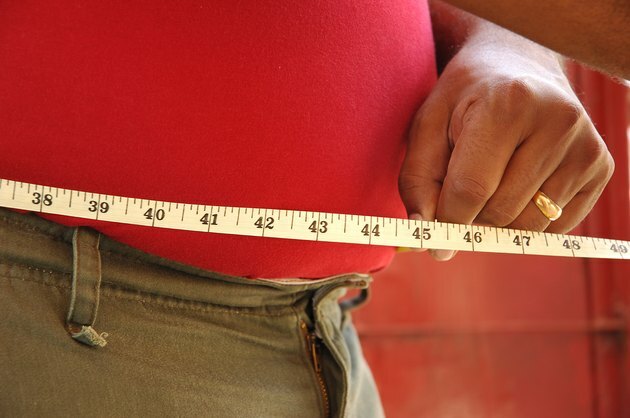 Visceral fat has been linked to increased risk of cardiovascular disease and type 2 diabetes. In women, excess abdominal fat increases the risk of breast cancer and the possibility of gallbladder issues. In men, the risk of colorectal cancer and sleep apnea goes up when you have a large amount of belly fat. One of the reasons why excess visceral fat is so harmful is its location near the vital organs. Your fat stores release substances such as free fatty acids, which can directly impact the surrounding tissue. Because of its close proximity to the major veins in the body, visceral fat is directly linked with high cholesterol and insulin resistance. Chances are, you have some visceral fat, but it's really a question of if you have too much. One of the key ways that researchers determine risk factors for excess visceral fat is simply by measuring the waist. Take a tape measure and measure just above your hipbone. Women should have a waist measurement of less than 35 inches and men should have one of less than 40 inches. Having a greater waist circumference indicates an excess concentration of visceral fat and greater risk of health problems. Losing visceral fat remains a challenge for most people because fat is an active tissue. Research has demonstrated that abdominal fat cells stimulate hormone production that can affect your health. The main hormone that is stimulated both by stress and visceral fat is cortisol. This hormone triggers the body to create and store visceral fat, while also stimulating hunger. Excess levels of cortisol in the body make it very difficult for people to lose visceral fat. Being in a state of stress leads to increased visceral fat and once this fat exists, the constant stimulation of cortisol production makes losing visceral fat challenging. Fortunately, visceral fat can be decreased through dietary and lifestyle changes. Regular physical activity helps to cut down on fat stores while also reducing stress. Yoga and Tai Chi are recommended for stress management. Dietary changes that increase consumption of fruits and vegetables and decrease saturated fat intake have also proven to be effective. Finally, cortisol levels can be reduced by getting enough rest every night, helping to decrease visceral fat stores. Managing these areas helps to lower cortisol levels in the body.